M33 (Triangulum Galaxy) in Triangulum. 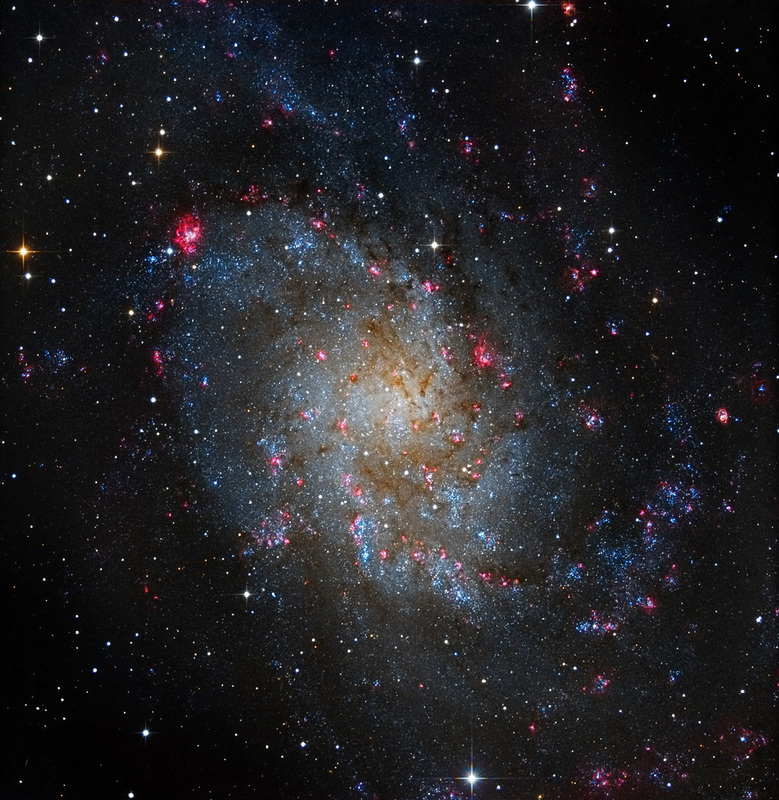 M33 (The Triangulum Galaxy) is the member of our local group of galaxies. It is over 50000 light-years in diameter, the third largest in the Local Group of galaxies - only our own Milky Way and M31 (Andromeda Galaxy) are larger. The popular names of M33 include the Pinwheel Galaxy or Triangulum Galaxy. The spacious spiral arms of M33 are rich in star forming HII regions. M33 is a faint and extended galaxy with a small, almost starlike nucleus. The light haze consist of faint stars, which shines in the yellowish light. Dark dust lanes can be traces into the nucleus. Unlike many other large galaxies, such as the Milky Way and Andromeda, M33 does not have a supermassive black hole in its center. From the nucleus, spiral arms reach out through the disk, which are populated by young hot blueish stars. They have formed from reddish diffuse nebulae, and indicate activity of star formation. Some of the bluish star clouds and reddish H II regions (diffuse nebulae) have been assigned by own NGC or IC numbers. The brightest and most impressive of M33's HII regions is NGC 604. This massive HII region spans about 1500 light years. There are also a number of globular clusters in the spiral arms.